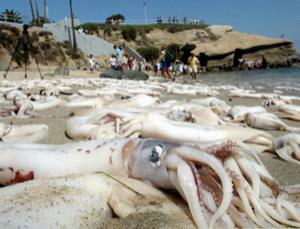 aeinews.org » Blog Archive » Squid grievously injured by LF shipping, seismic noise? Squid grievously injured by LF shipping, seismic noise? New research indicates that squid and their relatives are injured by exposure to low frequency noise similar to the “acoustic smog” created by widespread shipping and localized seismic surveys. This is the first study to show physiological damage caused by noise in animals who do not have ears or hearing organs. The study exposed squid, cuttlefish, and octopuses to two hours of low frequency sound in a variety of frequencies from 40 to 400Hz; the fish were in a tank, and could not move away from the noise. According to a report in New Scientist, the researchers “were astonished by extensive damage to the statocyst, a bulbous organ in the head of cephalopods that senses gravity and motion, enabling them to balance in the water and direct where and how fast they swim. Without this organ, cephalopods are practically powerless to move, are unable to hunt, and will become easy prey themselves.” In 2001 and 2003, giant squid were found beached in an area where seismic surveys were taking place; though the injuries observed then could not be tied to acoustic trauma, the new research suggests that such damage can be caused by sound exposure. Post-mortems showed that the linings of statocysts from cephalopods not exposed to sound retained the fine hairs that sway as the animals move through water, and are essential to the animals’ balance and orientation. Statocysts from the exposed animals, by contrast, had lost huge patches of hair, leaving holes in the membranes of the organ’s cells. The insides of the cells had pushed their way through the holes, and mitochondria – the power plants of cells – had suffered extensive damage. By killing and examining the animals at intervals up to four days after the single sound exposure, the team showed that the damage got worse with time, long after the sound had been turned off. The sounds used in the study were of moderate intensity: SPLs of 157dB re 1uPa, with peaks at 175dB, roughly equivalent to the sound of a large ship at 100 yards or a seismic survey at 500-1000 yards. (By comparison, injury is not presumed to take place in marine mammals unless sound is 180-210db). Similar studies in fish, using caged animals, have sometimes found similar hair damage to hearing organs, but only at much higher sound levles, and, in many cases even high levels of sound did not cause such injury. UPDATE, 4/15: While this study has been widely praised as an important step in understanding possible noise impacts on a new family of ocean creatures, there are some caveats being put forward as well. Michael Stocker of Ocean Conservation Research notes in a letter to his network that it is as yet unclear whether the impacts are more related to “particle motion” or “pressure gradient” aspects of acoustical energy, so “it could be that the closeness of the lab signals may have different impacts than equally loud exposures generated from further distances.” T. Aran Mooney, who agrees it’s a “good first step,” suggests that more information is needed about how the noise exposure was measured. And of course, these results will need to be replicated and expanded upon, as always.